We’ve got competitions for all age groups from Under 6’s to Over 35’s. For the littlies, it’s a great introduction (or re-introduction) to the world’s favourite game. For the big kids (meaning the adults), it’s way more fun than pre-season training and will get your fitness, ball skills, touch, communication and teamwork all sorted out before the start of your winter 11-a-side season. FootballSSG is so excited to again be offering a Summer Months competition that will commence in late January and conclude in late March. For more details read the Questions and Answers below ... effective 30th January, registrations for this season have closed. The Summer Months Competition will kick off on Monday 21st January 2019. Where will the games played? All games in the Summer Months Competition will be played at David Thomas Playing Fields, located at Sloane Crescent, Manly Vale (just around the corner from Warringah Mall). We are trying hard to secure a field in the Warriewood/North Narrabeen area but Council have yet to provide confirmation for us (fingers crossed - we know you want it and we’re trying to get it for you!). What time will the games played? The youngest players (Under 6/7) will kick off first and then we’ll run through the age groups, with the “biggest kids” (the adults) playing in the later time slots. The latest possible kick off time is 8:30pm. When will the season finish? The Summer Months Competition will conclude mid-to-late March. The actual finish date may be affected by inclement weather (ie - we may need to postpone games if there’s storms etc) which would push back the end date of the season. The season will be finished before the end of March. How do I know what age group to register for? Your age group is determined by the age that you will turn at your birthday in the calendar year of the competition. If you are turning 8 years of age in 2019, you are considered “Under 8”. If you are turning 15 years of age in 2019, you are considered “Under 15”. If you are turning 35 years of age in 2019, you are considered “Over 35” (even if you’re still 34 while the Summer Months Competition is being played). If you need to purchase a new kit, these are available for $20 (includes shirt, shorts and socks). which includes player insurances as well as a playing kit (shirt, shorts and socks). 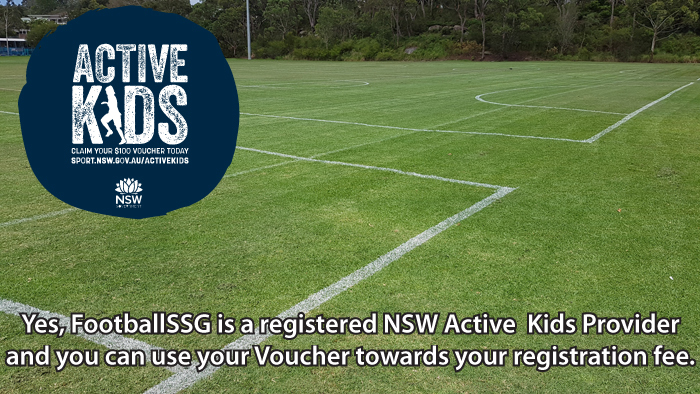 Parents of children wanting to play are reminded to apply for your NSW Active Kids Voucher for the 2019 calendar year ASAP after January 1st. We will email all registered players late in January to remind you all to send us your vouchers to claim the $100 rebate as a refund off your registration fee. We haven’t automated this yet and the manual process takes about 4-5 weeks to do, therefore vouchers will be processed as a refund during the season. With your Active Kids Voucher, you could be paying as little as $30 for your child to play in the Summer Months competition! The fee is all-inclusive and covers the cost of the fields, the referees, match balls supplied for every game, player insurances, etc et and, for players new to FootballSSG, a playing kit (shirt, shorts and socks). Do I need to wear a FootballSSG playing kit or can I supply my own? Every player in your team MUST be wearing a FootballSSG-supplied playing kit. You CANNOT wear any other playing kit. Persons who are not wearing the correct playing kit will not be permitted to play. Is it 5-a-side or 6-a-side? All games in all age groups will be played 6-a-side ... that means a goalie plus five other players on the field. How many players do we need to have in our team? (b) because we’ve based the registration fee, which obviously needs to cover the cost of running the competition, on the expectation that each team will have at least eight players. Can we have more than eight players in our team? Yes, you can have as many players in your team as you want BUT you can only have ten (10) players involved in any game. Note that we recommend that either eight (8) or nine (9) players is best, assuming that everyone turns up to play each week. Definitely yes. When we have sufficient teams registering for an age group, we grade them (based on the information you provide at the time of registering) so that teams are as evenly matched as possible. Registrations are open now and will remain open until the start of the competition. Please note that no new teams will be accepted in to the competition after 13th January (unless that team would create an even number of teams in an age group) as it would otherwise be impossible to produce the fixtures in time to start the competition. Registrations for this season are now closed (effective 30th January 2019). Is there a discount if I am late registering? No, late registrations do not receive any discount on the registration fees.